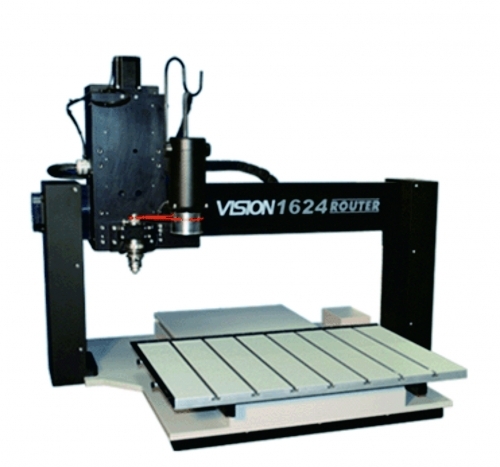 1624R Small CNC Router Features The NEW 1624R CNC Router/ Engraver allows production shops to maximize work space with huge capabilities! Tracing it's lineage from our very popular 25 series and 16 series systems, we have built a CNC machine with the field proven durability and quality you can only find in an American made Vision CNC Router! Featuring our state-of-the-art Vision Series 4 Controller and our graphically advanced Vision software, this machine is perfect for a wide variety of applications including milling, drilling, contouring, routing and more! 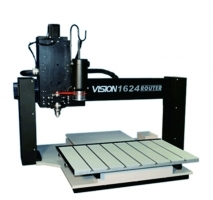 The 1624R CNC Router: • 16" x 24" aluminum T-slot table to accommodate various work-holding fixtures • Red Laser Pointer for easy job set-up • Includes Series 4 Controller w/ Hand-held pendant • Optional Raster™ Braille Inserter for automatic Braille bead insertion • NEW Optional Oscillating Knife for cutting semi rigid materials • A limited 2-year warranty Applications: ADA-compliant signage, Routing out wood signs, Cutout letters, Control panels, 2 1/2D and 3D signs in sign foam, wood and more! Our 1624R Router is made in the USA, built to be rugged, and backed by a superior customer support team.